The start of the school year can be filled with excitement and anticipation, no matter whether you are starting at a new college or university, going back to old friends, or finishing your final year. 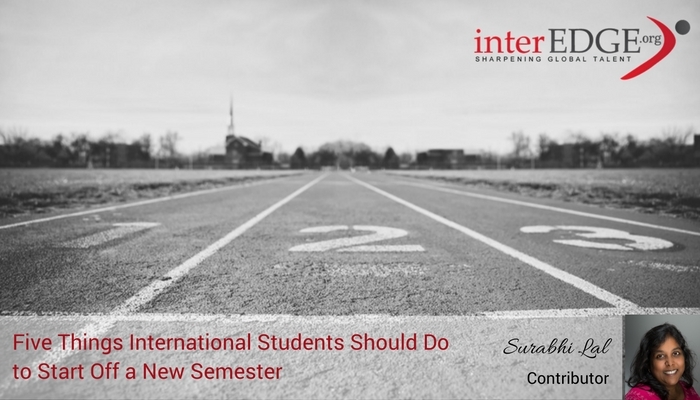 You will undoubtedly have new classes and professors, maybe a new place to live, many friends to meet, and some of you will start looking for an internship or full-time job. It is tempting to concentrate solely on academics and wait until the middle of the semester before thinking about your career. In fact, there are many things you should do in the first few weeks of the semester to be career ready. Visit the career center: Many career centers have an orientation where you can learn about programs and events and mark your calendar for those that are most relevant to you. If you are a junior or graduating this year, pay special attention to employers who come to campus early in the fall to recruit for summer internships and full-time positions. To be a candidate in these on-campus recruitment processes you may be required to attend an orientation before applying. No matter what your year, meet with a coach or advisor to talk about your career goals and learn about the recruiting timelines for your career of interest. Prepare your resume: Revising your resume is something you should do on a regular basis. If it is your first semester in the US, learn the basics of a US resume by using a resume guide or attending a resume workshop. Draft a version that you can take to the career center to have reviewed. If you are adding your most recent work or internship experience, make sure that it accurately portrays the professional image you want to convey. Explore various careers: Attend events like career panels and employer information sessions to get a deeper understanding of the types of roles and employers that exist. You might find that some roles or industries appeal to you more than others, which will allow you to tailor your internship experience and coursework accordingly. You can-and should-attend these sessions even if you are not actively looking for a position. They are helpful in guiding your career exploration. Develop your career story: Craft a story that includes a little about your background, personality, and career interests to share with professional contacts you meet. Practice this short introduction with friends and a career coach or advisor. Once you are comfortable with your story, use it at career fairs, employer information sessions, and at networking events. Change your story depending on the context of your conversation and revise it as you move through your professional career. Understand your visa: You will likely already know about the international student office before arriving on campus. Stay connected with them to understand the specifics of your visa and to take advantage of their programs connecting you to resources and other students. Embarking on an academic and career journey can be overwhelming and is easier with a support network. Connecting with others who are from the same country or part of the world is a natural connection. The joy in meeting someone who speaks the same language, shares the same cultural norms, and eats the same cuisine makes the transition to new situations much easier. It is just as important to find friends who do not share in your core identities, those who have similar academic, career, or personal interests. As an international student, both types of friends can help you understand the US culture, its nuances, and ways that it differs from your home country. On a very practical level, having to speak in (American) English to those who don’t speak your native language will make you feel more comfortable as you move into your professional career. This blog article was contributed by Surabhi Lal and draws on over a decade of career development experience. The opinions expressed are the author’s own and do not necessarily reflect the views of NYU Wagner.